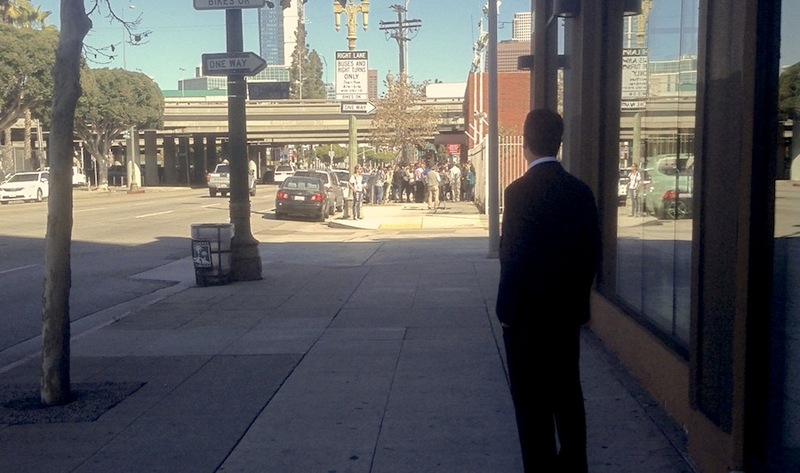 A BYD executive stands outside its Los Angeles office, overlooking protestors. Several labor and social justice organizations gathered outside BYD Motors’s downtown Los Angeles offices on Halloween to protest against the company’s alleged labor violations and call on the three public entities—Long Beach Transit (LBT), LA Metro, and The City of Los Angeles—to back away from their investments in BYD. Earlier this week, two national stories—one from the New York Times and the other from the Los Angeles Times—broke word that the $30B company was facing nearly $100K bill brought forth through an investigation by the the California Department of Industrial Relations’ Division of Labor Standards Enforcement. This acts as the latest in a string of criticisms and problems facing BYD Motor, a subsidiary of China-based BYD, ever since it won the bid to provide LBT with its mostly federally-funded procurement of electric buses. Those buses are supposed to hit the streets of Los Angeles and Long Beach next year, with LA Metro awarding a $20.7M contract and LBT handing a $12.1M contract to BYD to manufacture and dispense the transit companies’ inaugural fleet of electric, zero-emission buses. Additionally, the City of Los Angeles invested $1.6M for BYD to build their Los Angeles office along Figueroa St. Speakers throughout the protest cited multiple downfalls that alluded to the “cost of cheap,” including recent welding issues that were discovered in the frames and bracket installation as well as cracks near the rear of the BYD bus discovered while undergoing Altoona testing. Standing just east of the BYD offices, Janis called on the protestors—holding signs that said “This is a sweatshop paid for by our taxes” and Electric Buses: YES! BYD: NO!”—to close their eyes for photographers to emphasize their metaphor that public officials have been asleep at the wheel. Whether those officials will continue to sleep—at least in the eyes of these organizations—is unclear, as Metro and the Mayor of LA’s Office has remained mostly mum on the subject.